“Live While Were Young”, the backdrops to to the 30 second spot, sold 341,000 copies during it’s first week–topping the Billboard Digital Songs chart–making the song the fastest-selling track by a non-US artist ever. On February 7, 2010, Brees became a hero in New Orleans when the Saints won Super Bowl XLIV defeating the Indianapolis Colts 31–17 in. Brees tied a Super Bowl record with 32 pass completions and won the Super Bowl Most Valuable Player Award. 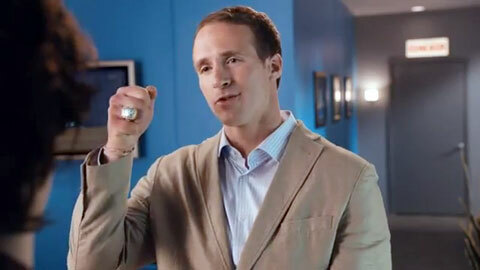 Brees was named the 2010 Sports Illustrated Sportsman of the Year, both for his winning the Super Bowl and his charitable work towards the reconstruction of New Orleans. On December 17, 2010, he was named AP Male Athlete of the Year. On July 13, 2012, the Saints and Brees agreed to a 5 year, $100 million contract. The contract has the largest amount of guaranteed money in NFL history ($60 million) with $40 million of the contract to be paid the first year. On October 7, 2012, Brees set a new NFL record passing touchdowns in 48 consecutive games, breaking the long standing touchdown record held by legendary quarterback Johnny Unitas at 47 set 52 years ago. PFP Sports and Celebrity Talent Agency is a speakers bureau and top booking agent for football speakers, athlete appearances and endorsements. If you would like hire Drew Brees for a speaking engagement, appearance, endorsement, autograph signing or special event, request Drew Brees agent and speaker information from PFP Sports and Celebrity Talent Agency. For more information call 800.966.1380.